Do you love a lightweight jacket that still provides ample amount of insulation from the cold? 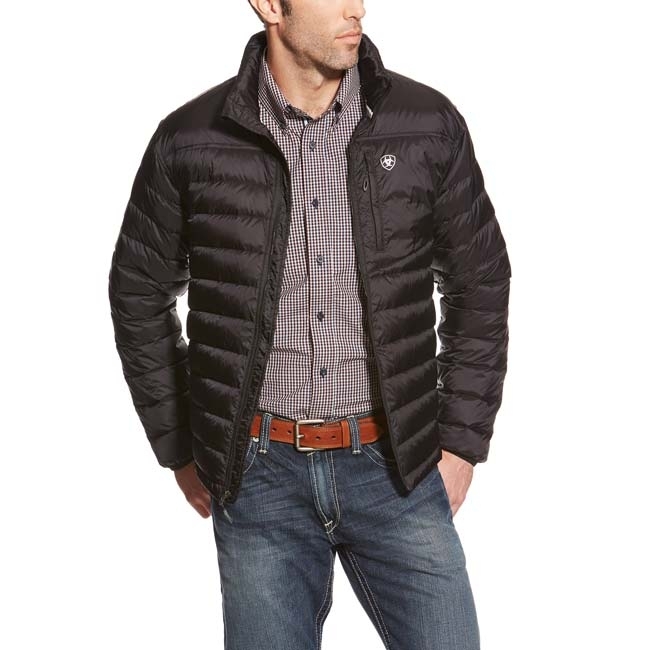 This Ariat Men’s Ideal Down Jacket II is exactly that. It has the ability to pack a punch against the weather while still remaining lightweight. It’s so lightweight that it can be compacted into a packable size through the use of the stowable interior pocket. You will be able to wear this jacket without feeling like you’re carrying around an extra ten pounds on your back, just to stay warm. NECK 14"-14.75" 15"-15.5" 16"-16.5" 17"-17.5" 18"-18.5"
CHEST 34"- 35" 38"- 40" 42"- 44" 46"- 48" 50"- 52"
WAIST 28"- 30" 32"- 34" 36"- 38" 40"- 42" 44"- 46"
LOW HIP 35"- 37" 38"- 40" 42"- 44" 46"- 48" 50"- 52"
SLEEVE 33"- 33.5" 34"- 34.5" 35"- 35.5" 35.5"- 36" 36"- 36.5"